Yes. Our technicians are fully certified to provide garage door installation, inspection, maintenance, repair and replacement services on commercial and industrial properties. As with our residential work, we provide free estimates, use parts Made in the USA and back our commercial work with a 100 percent customer satisfaction guarantee. Commercial customers typically need to use durable garage doors that are far more taller, wider and heavier than average residential ones because they deal with large trucks, buses and other forms of transportation and greater garage safety and security concerns. Commercial property owners often need garage doors in different types and sizes at a single location. Although we offer over 1,000 garage door options, including commercial impact-resistant, sectional, automatic sliding, insulated, storefront and rolling steel doors with and without windows, commercial door designs don’t vary style-wise as much as residential designs. That said, you can still find plenty of commercial and industrial options to fit your specific needs. Since commercial doors often experience more surface impact than residential doors and provide a doorway seal for buildings that house expensive equipment, materials and other items, it’s important that you select a thick door that includes features capable of providing you with the highest level of security possible. The door should also function in the most efficient and smoothest ways possible so that it opens and closes quickly with ease on high traffic or loading and off-loading days. It’s important to keep in mind when buying a commercial door that you should order the best from the start. A lower-priced door can bring your initial start-up or new building location costs down, but you ultimately pay more over the lifetime of the door: lower-priced doors and related components break down faster. Do you repair home garage doors? Yes. We repair both residential and commercial garage doors and openers. Our technicians have experience with a wide range of brands, including Chamberlain, C.H.I. Overhead Doors, Clopay, Genie, Ideal Door, LiftMaster Professional, Linear, Overhead Door, Raynor, Sears, Stanley, and Wayne Dalton. We provide a completely free estimate after inspecting your specific garage door problem. Given Nevada’s semi-arid climate, we commonly see shrinkage problems that require simple realignment and re-balance corrections. These same problems can occur with normal usage along with operational issues that require that we repair or replace one or more components like damaged track rollers, broken springs and cables or old hinges and motors. We also offer shaking door pulley repair, noise reduction, bolt tightening, safety sensor realignment, track realignment and door jam assistance, and we provide door seal advice and replacement options. Garage door seals often experience fault problems like fringing and cracking with regular use over time. You should typically have these seals replaced when you start to experience a draft into the garage from under the door, find pests inside the garage and see a gap beneath the door or observe major changes in the seals or how they attach to the door. As with emergency calls, our technicians arrive for repair calls on time with all of the tools that they need to complete same-day repairs and call ahead if they experience any delays. They utilize our 25-point inspection guidelines to check the problem and determine if any other repair problems exist. They then provide you with a no-cost repair job estimate in writing so that you’re never surprised by any costs. We again value your time. With that in mind, our technicians work as quickly and efficiently as possible once they have your approval in writing to proceed with the repairs. If partial or total parts or equipment replacements come into play, they sit down with you to discuss every available option. They also make certain that your door is balanced before they complete the repair job or even hand you a final invoice. Your garage door should open and close with ease at a steady rate, open to the halfway point and stop without sliding out of position and close without slamming after they’re finished working on it. Beyond repair calls, we also offer garage door maintenance and lube services. Residential and commercial property owners should invest in yearly garage door maintenance by a professional to reduce the risk of expensive emergency door breakdown and repair calls. The semi-arid climate and environment around the Reno and Sparks areas often causes the lubed parts of a garage door to experience exposure to much more dry air and debris than in other cooler and wetter geographic areas. As a result, our maintenance and lube services help decrease the risk of oiled springs losing their flexibility and breaking down faster while enduring natural wear and tear every time you open and close the door. If you don’t properly maintain the springs, dry spring misalignment can also cause a loud and annoying metal-on-metal or squealing noise on a regular basis. Can you help me with my broken garage door after hours? Yes. We understand that a broken garage door can do more than serve as a mild irritation or create a headache for residential and commercial property owners. A broken door makes it difficult to use a garage, especially if the door is stuck halfway up or refuses to open at all. A non-working garage door also poses a real security risk since thieves can slip in undetected when a door remains partially open overnight. Never hesitate to call us at any time with your emergency garage door repair needs. We offer 24-hour, round-the-clock emergency on-site repair and replacement services. Our caring answering service agents will take down all of your information, including the nature of the problem and your name, address and contact details. They will then provide you with an estimated arrival time. Our technicians usually arrive within a short time frame after an emergency repair request and call ahead if they experience any unavoidable traffic delays like car accidents or road construction. We understand that garage door breakdowns can happen at any time and that our emergency repair call customers shouldn’t be charged more for a quirk of fate, which is why we never charge extra for calls outside of our normal business hours during early mornings, evenings and weekends. We also offer a free estimate after our knowledgeable technicians inspect your specific situation following industry standard 25-point safety inspection guidelines. Our technicians never start a job until they have your express, written approval after they provide you with a detailed, written cost estimate. Once you approve any necessary work, they always attempt to complete the job that same day. Sometimes a repair requires that they order replacement parts and come back at a late date. In any scenario, they’re fully invested in providing the best service possible. We are also proud to use and order high-quality, brand name materials, hardware and garage door products for all repairs that feature the Made in the USA label. We never use off brand parts that might be made of lower quality materials that can cause your garage door to break down faster. If our technicians must replace one or more parts, they provide you with more than one option, if possible, so that you can find the best one to fit your budget. Sometimes our technicians find that a garage door or opener needs total replacement. They realize that your garage door is too old or has damage that is too extensive and repair work simply won’t be enough to guarantee that the door functions properly for the remainder of its manufacturer-estimated lifetime. When this happens, they provide you with detailed information about available replacement door and opener options and a no-cost and no-obligation price purchase and installation estimate. What Is headroom, and how much headroom do I need? The term sideroom refers to the distance between the sides of the garage door and the side walls or any nearby objects like ducts, pipes and shelves located inside of the garage. The term backroom refers to the distance between the door, track and opener and the back wall and any obstructions. As you can guess, the term headroom then refers to the distance between the door’s top and any low ceiling or related obstructions like ducts, pipes and even hooks for hanging storage items. Manufacturers have specific headroom requirements depending on the size and weight of a door, associated accessories and its use in a residential or commercial setting. In residential installations, the spring system for the door must be taken into account. Some manufacturers, for example, require an additional 10 to 12 inches of headroom space to deal with extension and torsion springs, respectively. An opener will require even more space. In commercial installations, the type, length and even weight of track systems matter in addition to the springs when considering headroom. If you don’t have the necessary headroom, it’s important that you don’t become too alarmed by the situation. Some doors with springs included have already been designed to take low headroom clearances into account, which means that you can reduce the required space needed by as much as 4.5 inches in some instances. Many manufacturers also offer special kit options designs specifically for low headroom. Garage doors experience damage over time from a variety of sources. For example, high winds and debris can cause impact damage. Inexperienced and distracted drivers can run into garage doors or nearby walls. Although modern garage doors are durable, even children at play can cause surface damage in different ways. When these mishaps occur, you don’t typically need to worry about replacing the entire door. Most door designs make it easy for our technicians to inexpensively remove and replace a section or panel without undermining the durability and life-span of the door. Of course, sometimes the damage goes beyond the cosmetic. As they follow our 25-point safety inspection guidelines to check the surface, our techs inspect the connected nearby parts to guarantee that the door can remain sound and working properly after repairs, as dictated by manufacture’s specifications. In some cases, they might also need to repair or replace operational components such as the door track and struts, springs or electrical opener system, to restore your door to its previous state. They also consider the cost of available options. Sometimes they recommend replacing the entire door for safety, functionality or long-term durability reasons. Although most garage doors arrive from manufacturers already painted and sealed with a durable finish designed to protect surfaces for years from the elements, you can also apply additional paint in any color that you find appealing to match your home or business needs. We understand that color changes go beyond personal taste at the residential level. Some home owners convert their garages into office or work spaces and desire the indoor door surface paint to match the garage’s interior paint scheme. A homeowner might also change the outdoor home and garage color scheme after so many years. Many business owners in certain industries, such as automobile repair and mass transportation, update their garage doors with their company logos and contact details. It’s critical that you read manufacturer warnings before attempting any sort of application. You should thoroughly clean the door with a mold-killing and slightly abrasive powder cleaner that can remove any dirt, mildew and other debris sticking to it and lightly rough-prep the surface for painting. Most manufacturers advise home and business owners to never use a pressure washer or any other tools like sandpaper since the underlying surface beneath the paint can become damaged during the preparation phase. What size opener (horsepower) is best for my garage door? Over time, your garage door can wear out its opener quickly from simple wear and tear no matter if it’s installed with near-perfect balance and weight distribution if you select an opener not recommended by the manufacturer for that specific door. You should always pick the type of opener that’s best-suited for your door’s size and weight. Manufacturers base opener options on available horsepower or HP. With lightweight metal doors, you should always go with a low-powered 1/3 HP opener. With slightly heavier single and double doors, you should select a medium-powered 1/2 HP opener. Lastly, with the biggest and heaviest doors, you should choose the most-durable and highest-powered 3/4 HP opener. Although some home and business owners choose to perform do-it-yourself opener installation, plenty of things can go wrong resulting in expensive professional re-installation, equipment replacement or repairs. You might select the wrong opener or install it in a way that ultimately causes damage to the door or other property and voids the door or opener warranty. Some owners also experience frustration during the installation process and consider do-it-yourself installation a hassle. Our technicians can install an opener for you at an affordable price in a quick and efficient fashion. We also back our opener work with the same guarantees offered for any other type of garage door job. Yes. We believe that our job on a project isn’t complete until the customer expresses their satisfaction. We back our work with both a 100 percent customer satisfaction guarantee and a limited lifetime warranty that covers parts and labor. Our well-trained and fully licensed, bonded and insured local technicians, who have more than 12 years of experience, always act in a caring and professional manner on every job and use the highest quality materials and tools. Although they work quickly and efficiently because they recognize that our clients value their time, they never leave a job half done. They also clean up after themselves before they come to you to announce that they’ve completed their work. We believe in helping our customers be informed decision-makers. For this reason, our technicians take the time to explain their process and show you their work. Not only do they explain their work plan before they start, they also outline the steps that they took to install, repair or replace your garage door, opener or associated accessories. They always try to answer every customer question to the best of their ability. 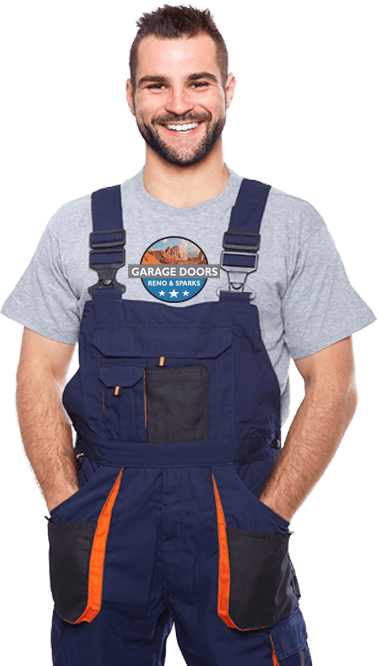 If a customer asks general garage door questions before, during or after the completion of a repair job, our technicians also take the time to provide those detailed answers as well. We always want you to feel like nothing has been left undone or unsaid. If our technicians don’t have an immediate answer, they never leave you hanging. They go above and beyond to find out the answer that same day or after and then provide you with the details. We also return swiftly to a site if something does go wrong after we complete a job. We are only as good as our word and reputation. We would never do anything to harm our business or leave our customers in a bad position. If your garage door stops working after we install or repair it, we will immediately address the problem. Even the best parts by brand name manufacturers sometimes come off production lines with a manufacturing defect that remains undetectable until daily usage and wear and tear reveal it. This is normal for any type of equipment across industries. It is the reason that car manufacturers, for example, perform recalls related to individual parts. It is also the most common reason for problems after an installation or repair job. When defective parts are involved, we find and install a replacement as quickly as possible and alert the manufacturer so that other home and business owners and property managers don’t have to deal with the same issue.